Stacey Nuveman and Honolulu-born Lovieanne Jung homered off nemesis Yukiko Ueno to power the Americans to the World Cup of Softball title last night with a 5-2 victory over Japan in Oklahoma City. 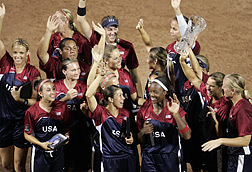 Andrea Duran also homered and Cat Osterman struck out 11 in a two-hitter as the U.S. avenged three losses last year to Japan, including the World Cup final, that created doubt about who was the top team on the globe. Sacred Hearts student Ayaka Kaneko shot a 1-under-par 71 yesterday and is tied for fourth place at the USGA's U.S. Girls Junior Championship at Carmel Country Club in Charlotte, NC. The 16-year-old from Honolulu is coming off a second-place finish at the Callaway Junior World Golf Championships in San Diego last week and carded three birdies and two bogeys yesterday in the first round of stroke play qualifying at the Girls Junior. The top 64 players after today's round advance to the match-play portion of the event, which begins tomorrow. Kaneko is among seven players at 1 under, two strokes behind leader Joanne Lee of San Carlos, Calif.
Britney Choy of Wahiawa is tied for 27th at 2 over, while Kauai's Miki Ueoka is 48th at 4 over. Former Hilo resident Kimberly Kim is tied for 60th at 5 over. Stephanie Kono of Honolulu is tied for 75th at 6 over and Kyung Kim of Wailuku is tied for 93rd at 7 over. » Sean Maekawa of Paauilo is tied for fifth place at the U.S. Junior Amateur Championship after firing a 2-under 70 at Rancho Santa Fe Golf Club in California. Maekawa is two strokes behind co-leaders Cody Gribble of Dallas and Philip Francis of Scottsdale, Ariz.
Two other Hawaii players are also in position to advance to match play. Honolulu's Tadd Fujikawa is tied for 48th at 2 over, and TJ Kua of Lihue is 59th at 3 over. Kamehameha graduate Brian Ching was named yesterday to the MLS All-Star team that will face English Premier League champion Chelsea next month. Ching, a member of the U.S. World Cup team and a forward with the Houston Dynamo, is second in the MLS in scoring with 10 goals for the Dynamo this season. The Outrigger Duke Kahanamoku Foundation yesterday honored athletic excellence in water sports and volleyball with $100,000 in college scholarship and athletic grants. At its annual "Mahalo Luncheon" at Outrigger Canoe Club, ODKF awarded $50,000 in college scholarships to 31 Hawaii students for the upcoming school year. Students must have at least a 3.3 GPA and demonstrate and financial need. Another $50,000 in athletic grants were award to accomplished athletes, community organizations and youth programs. More information is available by calling 545-4880 or on the ODKF Web site: www.dukefoundation.org. A complete list is in Scoreboard, Page B-4. Kauai's Andy Irons was eliminated in the second round of the Billabong Pro by fellow Hawaii surfer Roy Powers yesterday at Jeffreys Bay in South Africa. Powers posted a score of 10.83 to edge Irons, who finished at 10.66. Bruce Irons was also eliminated, placing third in his first-round heat.